Three beauty pageant winners wearing their “Miss” title sashes. If you don’t know the difference between “Miss USA” and “Mrs. USA,” then this post is for you. Photo by Glenn Francis. Good afternoon, and welcome to Word Wednesday! This will be our final post on titles for addressing people in English. In the last week we’ve talked about how to use the title “professor” and the job description “teacher,” and a while ago we talked about naming customs in the USA, where we looked at a few titles. It’s sometimes appropriate to include the person’s first name, but only if you also include the last name. For example, you could call me “Mr. Sitzman” or “Mr. Ryan Sitzman.” The first is more common if you’re talking to the person, and the second is used more when writing. You should not say something like “Mr. Ryan,” though, unless the person you’re speaking to asks you to do so. Another quick note: If you don’t know a person’s title, then it’s normally perfectly acceptable to ask “What should I call you?” to a person you meet. If he or she includes a title like Doctor, Admiral, or Professor, then use the title they tell you. Or, they may say something like “Just call me Jimmy”; if they do, don’t call them something like “Admiral Jimmy Akbar” if it goes against their wishes. Doctor (often abbreviated “Dr.”): This is used for people who have an MD (doctor of medicine), DVM (doctor of veterinary medicine), or other doctorate-level degree. It’s more common for people in the medical profession, but often university professors use the title “Doctor” after completing a PhD (doctor of philosophy degree). Professor: As we discussed a few days ago, this is normally for people who have graduated from the university with a PhD (doctorate of philosophy degree). My friend Marie also pointed out that often university instructors with an MA (master’s degree) are addressed with this title. Any military rank: Depending on the branch of the military, these titles can include Private, Captain, Lieutenant, General, Admiral, etc. 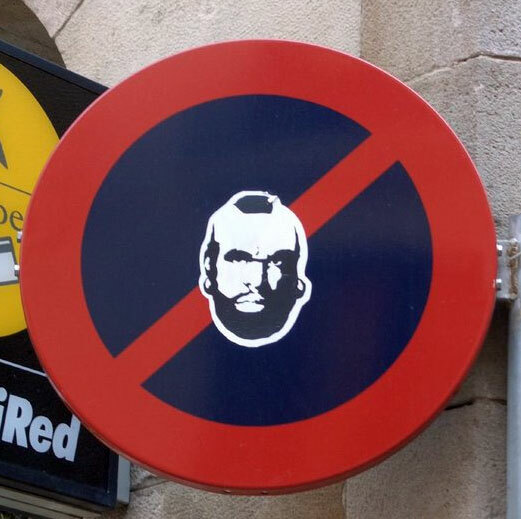 A joking sign featuring Mr. T. What does the “T” stand for? Mister (normally abbreviated “Mr.”): This is the common, general title used for all men, married or unmarried, who don’t have a different title (like Doctor or any other title mentioned above). So if she’s “Miss USA,” does that mean her last name is “USA”? Good question. Miss: (click for pronunciation) Used for unmarried and/or young women, and generally followed by the last name. Mrs.: (click for pronunciation) Used for married women, and generally followed by the husband’s last name. Important note: this is not the “plural” of “Mr.”! Ms.: (click for pronunciation: notice it’s pronounced with a /z/ sound, not /s/). Used for married or unmarried women. If you don’t know if a woman is married or not, this is a safe choice. Also, some women choose to use this as their title since it’s really nobody’s business but their own if they’re married or not, and the title “Ms.” allows them to keep that information private. So, that’s it for today. Hopefully that’ll help you in your social interactions in English. Why is “Mrs. Camile” wrong in person? I dislike being called Mrs anything but accompanied by my married name makes me feel like I’ve lost my identity completely. If parents insist on their kids calling me Mrs then I meet them in the middle and have them call me Mrs. Camile. I didn’t know this wasn’t ok.
Hi Camile, thanks for the comment! I guess I wouldn’t say it’s not “OK,” it’s just that in the majority of cases, if you use a title, it goes with the last name. Although like you mentioned, if it’s a term of endearment or if someone wants to be called Mrs., Miss, or Mr. plus his or her first name, then I agree, it’s fine. It may also be that you have different customs in Canada, especially in French-speaking areas. I think nowadays if you used “Ms.” plus your maiden name, that wouldn’t be too weird, either. At least that’s what my wife does. I’ll make a change to the post to mention this. I guess since I’m not a “Mrs.” I’d not seen it from your perspective. I’d argue that it’s not the parents’ place to tell their kids what to call their friends’ parents, if that contradicts what that person wants to be called. You seem to have found a good middle ground there.